Anyone with a website needs to create pages that don't necessarily have lots of photos on them: About, your mission statement, pricing, etc. If you're using old SmugMug, you've probably earned a badge trying to create non-gallery pages using Advanced Customization. You've had to copy and paste complicated code to hide parts of your gallery page, then hand-type in HTML to get what you wanted. 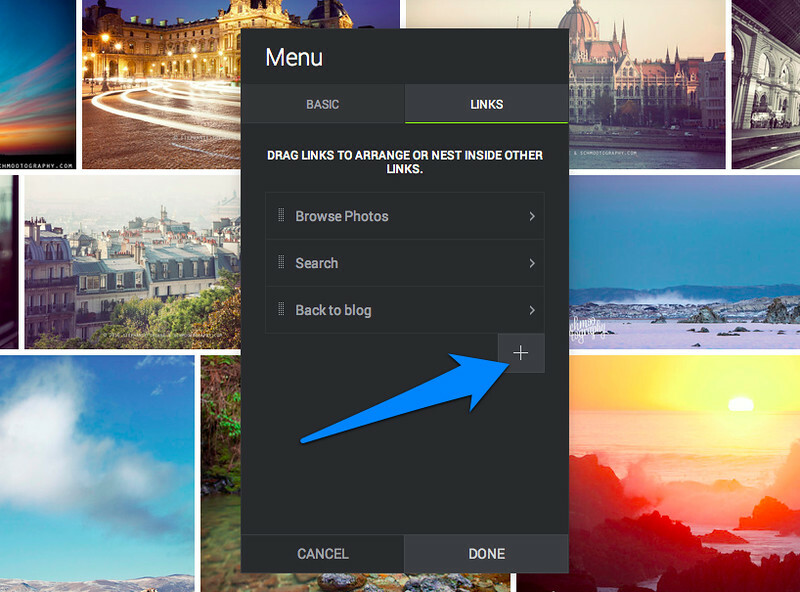 With the new SmugMug it's as easy as drag, drop, and go! Here's how to do it in 3 simple steps. P.S. Creating Pages is a customization feature available on Power, Portfolio and Business accounts. 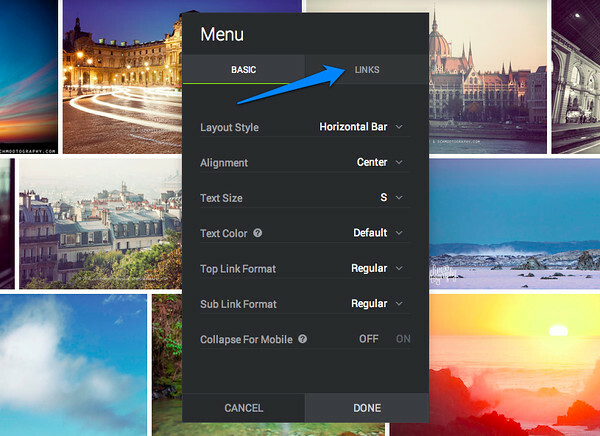 If you're a Basic user, you can customize your homepage using any of the Themes and content blocks we provide, but you may not find all the options listed below. First, create the page you want. 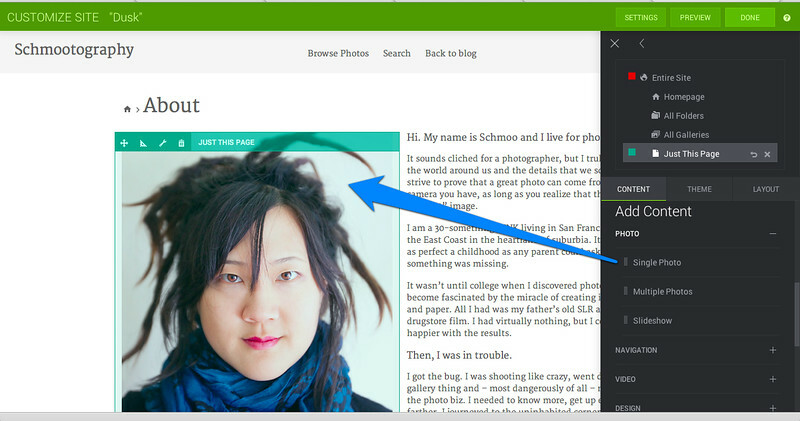 If you want to create an About Me page, for example, start by hitting the Organize > Create > Page button in your header. Give it a name, keywords, settings, whatever you wish. Hit the Done button in the top left of your window to save. Organizer. You can drag it into any other place (like into a Folder) if you want it elsewhere. Find the page that you just made. 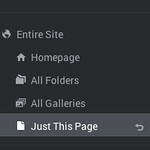 You can do this by typing in the URL for it, or you can click the link from the preview window in your site Organizer. Once you're at your new page, open up customization from the header: Customize > Customize Site. To confirm that you'll be applying changes to just the one page (and not your whole site), look for the following folder list at the top right. Personalize the page however you wish. 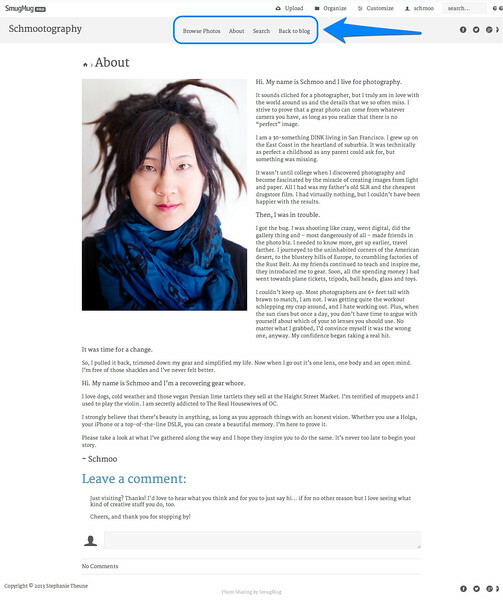 You can change the Theme if you want a different color scheme on this page versus any other part of your site. Don't forget to browse through the many different content boxes from the "Content" tab and drag the ones you like into the middle, the side, the bottom, wherever you want onto your page. A light green box will appear in any spot that can accept a block. If you miss, we'll show you a dotted outline mapping out where valid areas lie on the page. Experiment and have fun! Remember that you get an instant, live preview of everything you're doing, but to clear the windows away just click the Preview button, and "Done" when you're finished. Copy the URL for the gallery from the top of your browser page, and click to highlight the top-level, "Entire Site," option from the top right. If the site design you've chosen comes with a menu bar, click the little wrench to open the edit box. If your design doesn't include a menu bar, Power, Portfolio and Business users can add one by dragging and dropping in the "Menu" content block from the Content > Navigation section. Click the little "+" sign to add a link to the menu. Fill in the copy you want, and past in the URL for the new page you just created. Click Done. That's it! Your new page is happy, gorgeous and accessible to all.